Driving isnt what it used to be. Today youre facing new rules of the road, distracted drivers, and updated technologies-entertainment and GPS navigation systems, ringing cell phones and beeping texts-that demand you take your eyes from the road, despite the hazards.Thats why AARP Driver Safety-the program that offers the nations first and largest driver improvement course for drivers age 50 and older-offers Drive Smart: How to Stay Safe-and Save Money.This e-book provides expert advice on todays traffic rules, driving conditions, vehicle technologies, and the dangers presented by other drivers. Youll find-* More than 125 tips to refresh your knowledge of the rules of the road* Recommendations to help you save money on auto insurance, fuel, and other driving-related expenses* Strategies to help you avoid distractions, drive safely in inclement weather and recognize when it may be time for a loved one to stop driving Drive Smart: How to Stay Safe-and Save Money provides valuable information to help you keep safe behind the wheel. 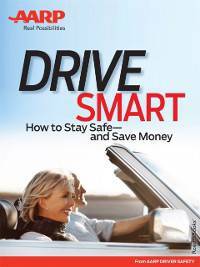 And if you suspect your loved ones driving skills could use a tune-up, then pass this e-book to them, too.